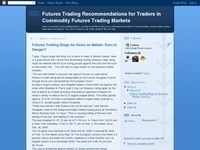 Like a commodity futures trading platform, my blog would like to drive you to necessary information.. for futures trading: weekly market reviews, trade recommendations. You want to stand on top of floor.. traders? We can help.